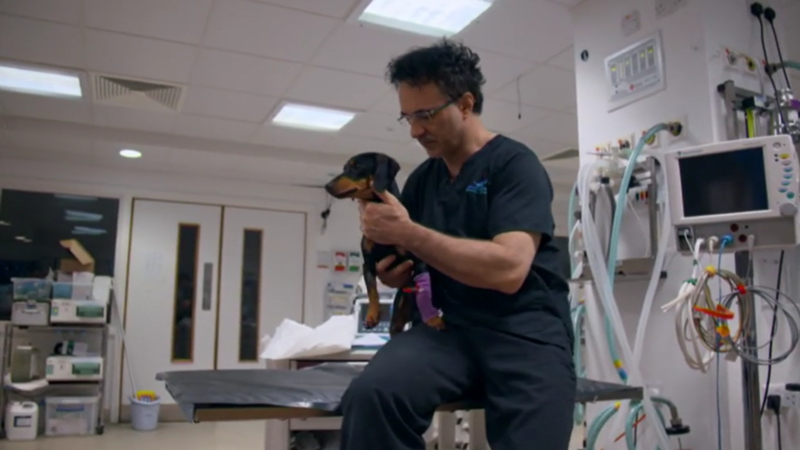 There is an emergency admission tonight when fifteen-month-old Dachshund Ralph is brought to Noel after Denise and Wilson discover that he is unable to move. Scans reveal that Ralph has a mystery brain condition and Noel, along with his neurology colleagues, has his work cut out to identify the cause, which they suspect could be anything from an infection to a possible stroke or tumour. Noel takes samples of cerebrospinal fluid to try to get a definitive diagnosis, but the results won’t be back for a few days. Meanwhile, Ralph is kept under observation and treated for infection, but when his condition rapidly deteriorates overnight, suddenly the life of this much-loved young dog is hanging in the balance. Stylish Dachshund Ralph and his sister Lauren live with parents Denise and Wilson in East Sussex. 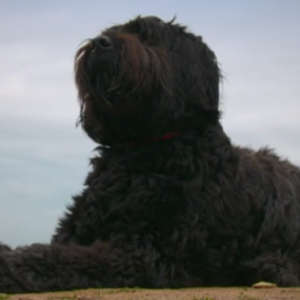 A distraught Denise and Wilson brought Ralph to Fitzpatrick Referrals after an incident in their back garden left him unable to move easily and in severe pain. They believed he may have been chasing a squirrel and injured himself behind a bush – causing him to yelp in pain. Their local vet referred them to Fitzpatrick Referrals to seek emergency treatment from Professor Noel Fitzpatrick. Whilst undertaking a physical examination, Noel commented that he was “roached like a banana”. After putting pressure on Ralph’s lower back, he yelped in agony, however, Noel could not determine where the pain was coming from. Ralph’s condition didn’t seem to fit the normal pattern for spinal disc problems that are common in Dachshunds, so he consulted Ricardo Fernandes in his neurology team. After sending Ralph for an MRI scan of his spine and brain, the pair noticed a swelling on his brain. Noel immediately took a sample of cerebrospinal fluid from the top of Ralph’s spine for further examination, along with blood and urine samples. It would take a few days to receive the results so in the meantime they would need to manage Ralph’s symptoms. Ricardo believed there could be a number of explanations for Ralph’s pain – from inflammatatory or immune-mediated diseases to a possible tumour or even a stroke. Whilst they were waiting for the test results, Noel and Ricardo commenced treatment in an attempt to reduce inflammation within the brain with steroids and antibacterial therapy. He remained at Fitzpatrick Referrals overnight but alarmingly began to seizure. The team then introduced further medications to help control the seizures and kept a close watchful eye on his condition whilst the results were being gathered. When the results were ready, Senior Neurologist Colin discussed the diagnosis with Noel. The team had identified that it was likely an infection in the midbrain caused by bacteria getting into the bloodstream – resulting in infection and swelling on the brain, which caused Central Pain Syndrome. He explained that it is very rare – neither Colin nor Noel had seen MRI results like Ralph’s before. They decided to treat Ralph with antibiotics to clear the infection. Denise and Wilson returned to collect Ralph two weeks later. Treatment was working well and he was making a miraculous recovery. The couple still needed to keep the infection under control by continuing medication at home but the outlook was positive. Style clearly ran in the family, as Noel was envious of Wilson’s scarf. “Sir you inspire me, if I could look half as elegant as you, I’d be doing alright” he gushed. He’s not right and his yelping is not good. We don’t know what is wrong. 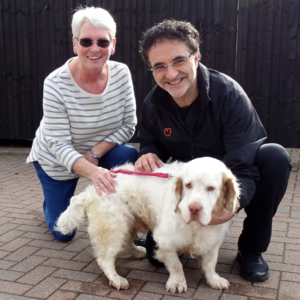 Four months after his visit to Fitzpatrick Referrals, Ralph was recovering from his infection and was a lot happier. Sadly, he had sustained some permanent brain damage due to the infection and remained on antibiotics and anti-seizure medication for some time. Denise and Wilson were feeling very hopeful and were just happy to have him back home, as they thought they would lose him. Every day they had him back was a blessing in their eyes.